Bertha Easton is my 2nd cousin 2x removed. Her parents are Robert Fraser Easton and Christiana Astin. Our common ancestors are Robert Astin and Nancy Dyson – my 3x great grandparents. Bertha was born on 25 August 1892 – her birth is registered in Burnley, Lancashire. On 9 October 1922 Bertha married Ernest Welch at the Bethesda Congregational Church in Burnley. Details of the wedding were announced in the Burnley News on 14 October 1922 (image from http://www.britishnewspaperarchive.co.uk). An interesting wedding took place at Bethesda Congregational Church on Monday last, the contracting parties being Mr Ernest Welch, only son of Mrs Welch, and the late Mr C Welch, of Waterloo Road, and Miss Bertha Easton, eldest daughter of Mr and Mrs R F Easton, of 16 Lansdowne Street. The ceremony was performed by the Rev J W Ffoulkes. The bride was daintily attired in saxe-blue crepe de chine, and wore a pan velvet hat to match. She carried a bouquet of lilies and white chrysanthemums. She was attended by her sister, Miss Dorothy Easton, who carried a bouquet of white and bronze chrysanthemums. The bride’s brother, Mr Edward Easton, performed the duties of best man. After the ceremony lunch was served at the home of the bride’s parents, and later the newly married couple left for Morecambe, where the honeymoon is being spent. Georgina Paley Aisbitt is my 2nd cousin 1x removed. Her parents are Matthew Gullford Aisbitt and Rhoda Paley. Our common ancestors are James Paley and Mary Ann Spink – my 2x great grandparents. Georgina was born on 24 August 1920 and her birth was registered in the East Ward district of Westmorland. Sometime in the first quarter of 1944 Georgina married Joseph Lynn Cuffley and a report of the wedding was published in the Penrith Observer of 22 February (image taken from (www.britishnewspaperarchive.co.uk). The marriage took place at Kirkby Stephen, conducted by the Rev C F Cardale, of Mr Joseph Lynn Cuffley and Miss Geanie Aisbitt, only daughter of Mr and Mrs M Aisbitt, The Crescent, Kirkby Stephen. The bride was given away by her father and wore a white satin beaute dress, with train, her veil being held in place by a spray of silk camelias. She wore white shoes and carried a bouquet of pink carnations with a “lucky” horseshoe. Miss Ethel Madden, who was her bridesmaid, was attired in a figured taffeta turquoise dress with short matching veil and gold shoes. Her bouquet was of tulips. Sergeant Conrad Maurar, Australian Air Force, was best man. Mr Donald Aisbitt (bride’s brother) was the usher. After the reception in the Temperance Hall, Mr and Mrs Cuffley went to Morecambe for their honeymoon, the bride travelling in a blue wool marocain dress, blue camel hair coat with shoes and hat to tone. The bridegroom’s gift to the bridesmaid was a handbag. The bridegroom has been in the Forces for 31/2 years as a despatch rider in the R.E. The bride attended Kirkby Stephen Grammar School. She studied for the teaching profession, which she intends to continue at St Hild’s College, Durham. For the past three years she has been on the staff of Havelock Junior School, Sunderland, from which she received a handsome mirror. The children of her own class combined to give her a brush and comb tray. Mary Musgrove is my aunty. Her parents are Fred Ainsworth Stowell Musgrove and Florrie Musgrove – my maternal grandparents. Mary married Laurence O’Hagan on 15 September 1956 in Clitheroe, Lancashire. The wedding was announced in the Clitheroe Advertiser and Times on Friday 21 September 1956 (image from http://www.britishnewspaperarchive.co.uk). The wedding took place at SS. Michael and John’s Church, Clitheroe, on Saturday of Mr. Laurence O’Hagan, third son of Mr. and Mrs. P. O’Hagan, of 8 The Crescent, Clitheroe, and Miss Mary Musgrove, youngest daughter of Mr. and Mrs. F. Musgrove, of 102 Whalley Road, Clitheroe. The bride, given away by her father, wore a gown of white lace over tulle. Her bouquet was of white roses. Mrs. Alice Dawson, sister of the bride, was matron of honour, and the Misses Lynn Dawson and Carol Musgrove, nieces of the bride, and Miss Patricia O’Hagan, niece of the bridegroom, were the bridesmaids. Mrs. Dawson wore a gown of lemon-coloured net over taffeta and the bridesmaids dresses were of lemon-coloured organza over taffeta. They carried Victorian posies of mixed flowers. Mr. P. O’Hagan, the bridegroom’s brother was best man, the bride’s brothers, Messrs. Harry and Tom Musgrove, sharing the duties of groomsman. The Rev. Father F. Hannan, S.J., officiated at the ceremony and Mr. K. Sherliker was at the organ. After a reception at the Station Hotel, Clitheroe, Mr. and Mrs. O’Hagan left for a honeymoon at Blackpool, the bride travelling in a tweed coat with tan accessories. Mr. and Mrs. O’Hagan will reside at 1 Derby Street, Clitheroe. Eveline Ivy Coulam is my wife’s 3rd cousin 1x removed. Her parents are Charles Coulam and Priscilla Rowbotham. Their common ancestors are James Padley and Sarah Bradshaw – my wife’s 3x great grandparents. 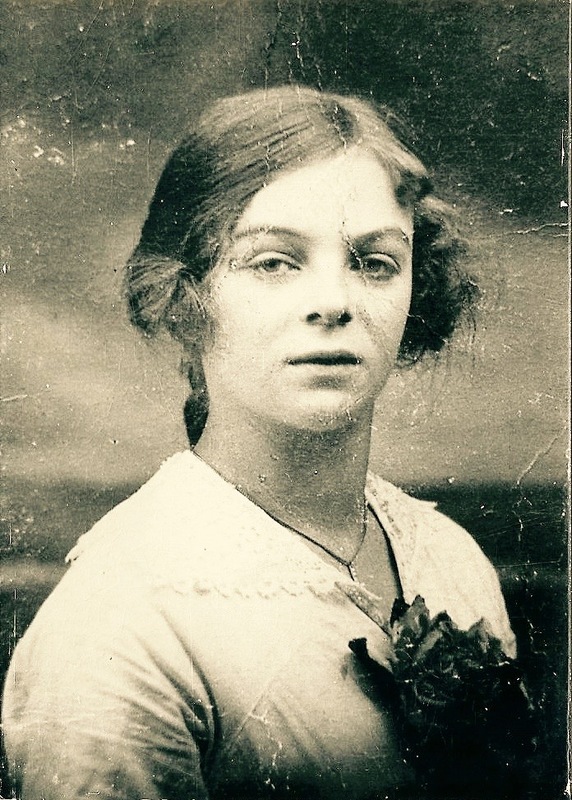 Eveline was born on 3 April 1920 – her birth is registered at Gainsborough, Lincolnshire. In September 1939 Eveline married Charles Carter – the marriage is registered at Boston, Lincolnshire. In the 1939 Register they are living at Lade Bank, Olivers Lane, Boston. Charles is described as a “farm worker” and Eveline as a “land worker”. The Lincolnshire Standard and Boston Guardian of 23 September 1939 carried a report of the wedding (taken from British Newspaper Archives website). THE MARRIAGE of Miss Evelyn Ivy Coulam, fourth daughter of Mr and Mrs Charles Coulam, Leake, Lade Bank, with Mr Charles Carter, youngest son of Mr J Carter and the late Mrs Carter, Midville, was solemnised at the Parish Church on Saturday. The Vicar (Rev A Gibbons) officiated at the ceremony. The bride, given in marriage by her father, wore a pretty frock of turquoise satin, with gold trimmings, with a coronet of golden velvet leaves, and her shoes and gloves in matching shade, while in charming colour contrast her bouquet was of pink dahlias and fern. Miss Rosemary Coulam, sister, as bridesmaid, was attired in a dainty frock of pink crepe-de-chine, with head-dress of gold leaves, and shoes and gloves of matching colour, and carried a bouquet of blue scabious and fern. The duties of best man were discharged by Mr Harry Moore, Tumby (‘groom’s friend). As the bridal pair left the church, little Rita Pinner (bride’s niece) presented a silver horse-shoe. The reception was held at the home of Mr and Mrs C Coulam, Lade Bank, where relations and friends were entertained. Many good presents were received. Mr and Mrs C Carter will reside at Lade Bank. Ruth Halstead is my 1st cousin 1x removed. Our common ancestors are Thomas Ainsworth Musgrove and Ellen Stowell – my great grandparents. Ruth married Albert Bentley on Wednesday 5 July 1933 at Moor Lane Methodist Church, Clitheroe, Lancashire. A report of the marriage was published in the Clitheroe Advertiser and Times on Friday 7 July (image from http://www.britishnewspaperarchive.co.uk). A large congregation of personal and other friends assembled in the Moor Lane Methodist Church on Wednesday afternoon to witness the wedding of Mr Albert Bentley, elder son of Mr and Mrs Arthur Bentley, of Moore Street, Burnley, and formerly of Barrow, to Miss Ruth Halstead, only daughter of Mr and Mrs Robert Halstead, of 1 Curzon Street, Clitheroe. The bride has been for some years a prominent member of the choir at Moor Lane and her services as a soprano soloist have been freely utilised by other churches and on the concert platform. She was also identified with the Parish Church Amateur Operatic Society. The bridegroom is well known in local cricket circles, having played in turn for Barrow, Whalley and Burnely St. Andrews. Several fellow choristers of the bride were in the choir and led the singing of the hymn “Crown with Thy benediction.” The ceremony was performed by the Rev. P S Johnson, and the duties of organist were fulfilled by Mr G Cowgill. The bride, who was given away by her father, looked becoming in a long ivory satin dress which had a yoke and puff sleeves of embroidered net, her veil, also of embroidered net, being crowned with a circlet of orange blossoms and pearls. Her bouquet was composed of pink roses. Miss Bertha Procter was in attendance on her cousin, wearing an ankle length dress of yellow spun silk which had a cape collar, the skirt being relieved with narrow frills. A yellow crinoline hat trimmed with velvet ribbon, and a bouquet of mauve sweet peas, completed her toilette. Mr Cyril S Aspden, of Colne, was the best man, and Messrs T R Halstead and G Steer the groomsmen. A reception followed at the Starkie’s Arms Hotel. For the journey to Douglas, where the honeymoon is being spent, the bride travelled in a Lido blue silk dress and grey coat which had Lido blue revers, grey hat and shoes to tone. On their return Mr and Mrs Bentley are to reside at 9 Wellesley Street, Lowerhouse, Burnley. They were the recipients of numerous presents. The bridegroom’s gift to the bridesmaid was a wristlet watch. Albert and Ruth had one daughter, Ruth Margaret Bentley on 13 July 1934. I have previously written about Ruth and Albert here. And about Ruth Margaret here.